The planning of your wedding puts you through a lot of costs and whenever you have the chance to cut some of these costs you are more than glad to count this chance in. This might include as well the alternative of homemade wedding favors since this option can be preferred to that of spending time and money on purchasing these favors. There are plenty of ideas to follow if you lack imagination in this regard, but generally speaking, when you think of ‘homemade’ stuff there is more likely to come up with edible ideas, such as baking gingerbread with decorative symbols as frosting, such as the initials of your names applied on heart shaped gingerbread. 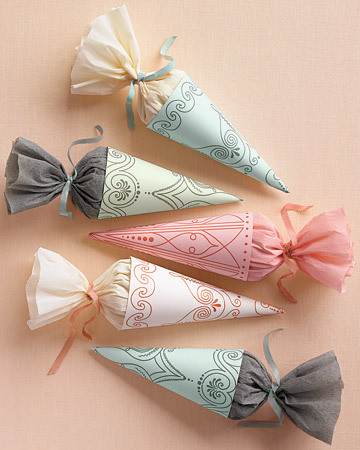 Another idea of homemade wedding favors can be to buy chocolate candies wholesale and have them wrapped in plastic foil with various colorful imprints and use a silk ribbon to tie them in a nice bow. How about buying essential oils in bulk and have it put in small bottles that have a personalized label with your names and the date of your wedding printed on it? For a more special touch you can have a ribbon in the color of the oil to tie it at the neck of the tiny bottle.You can as well summon your family and close friends to help you with your homemade wedding favors as they might have their own creative ideas to assist in your task. Opting for homemade cookies, it is something that can be easy to do at the same time finding colorful ways to have them presented to your guests. Browse through online pages and see what other couples have come up with as their own DIY favors; you can never know how other brides’ ideas can be a great source of inspiration for your costless wedding favors.